MeeTime Is Used By Employees In Goldman Sachs, Rolls Royce, Nielsen, Molson Coors, Hewlett Packard & DXC, amongst others. Had a terrible meeting today? You are not alone. But there is a better way. 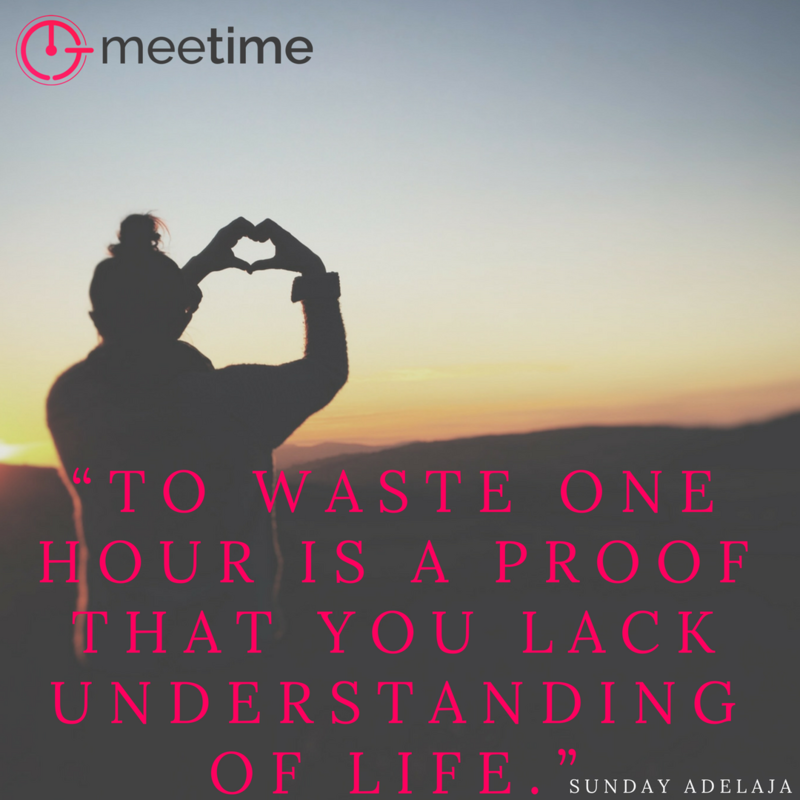 At MeeTime, we are passionate about helping people save time to do the things they love. MeeTime will start when the meeting is supposed to start. If you are behind, guess what? You're behind. MeeTime will help keep you on track with beautiful visuals showing how much time is left and who is on point for each section. 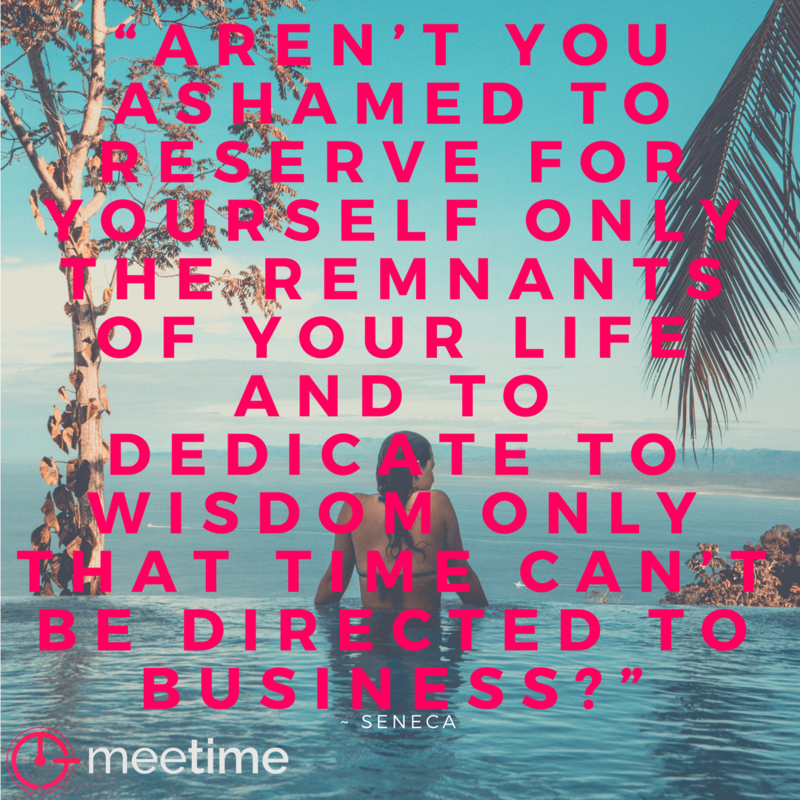 And it is easier than ever to finish a meeting on time with MeeTime. Should things not go to plan, the “Auto time remaining” setting automatically apportions over/under-runs across the remainder of the agenda. “This is a great, great idea and it has massive potential. I truly believe that this has got great potential to help a large number of people!” ~ Chris Bateman, Global Senior Manager, World Class Supply Chain, Molson Coors Europe. "This is an awesome idea! I love this. 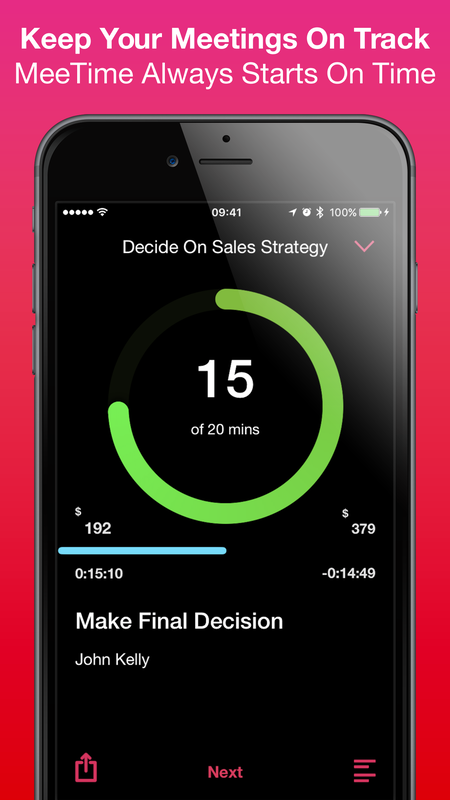 It is indispensable to have an app that breaks down the agenda of a meeting by each point and the time frame for each! I'm in a lot of meetings and this is going to be a go to app! !” ~ Richmond Nash, Productivity Coach. Create Your Agenda. Enter Owners For Each Item. Time Is Money. Add Attendees & See How Much Each Meeting Costs. Stay On Time. See When Time Is Short. See Meeting Costs In Real Time. Set the agenda in advance with the help of MeeTime. 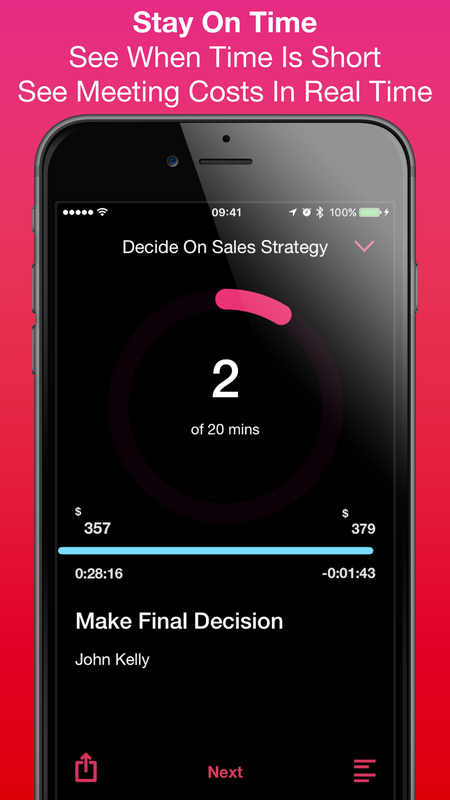 Think upfront about who is doing what by when in the meeting and what do you need to decide? ​Just like running a project, set deadlines and accountabilities for each agenda item. See the upcoming meetings that you are going to run. Add them to your calendar and invite participants. Share the agenda with your favourite note taking app for ease of taking minutes. 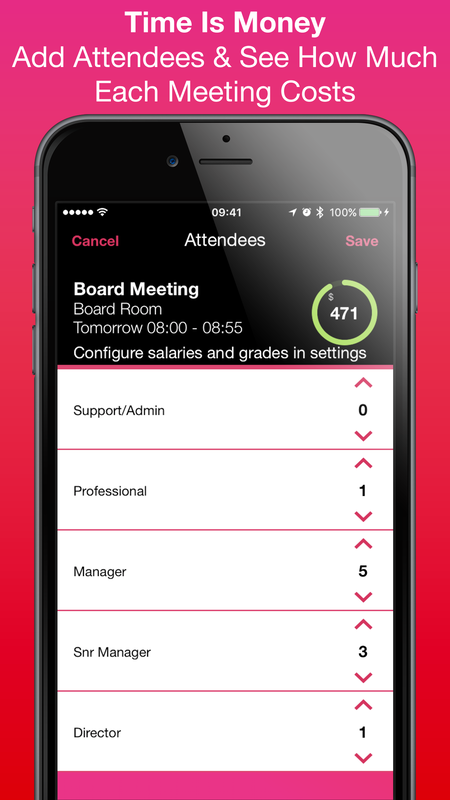 There are already a wealth of apps to help schedule meetings and meet quicker than ever. This means we are having more meetings than has ever been possible before. It is hard to keep people on-track and run productive meetings. It is also hard to tell someone else that you hate their meetings. Have you just been stuck in a terrible meeting? 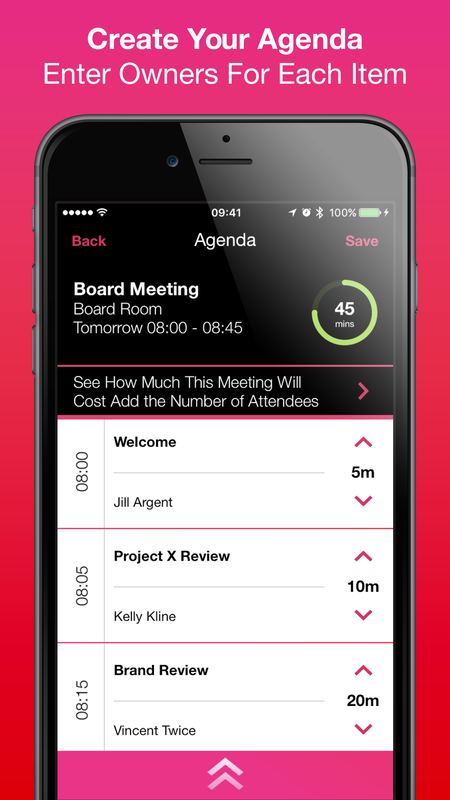 Share this with someone that could benefit from keeping meetings on track. There is a better way. 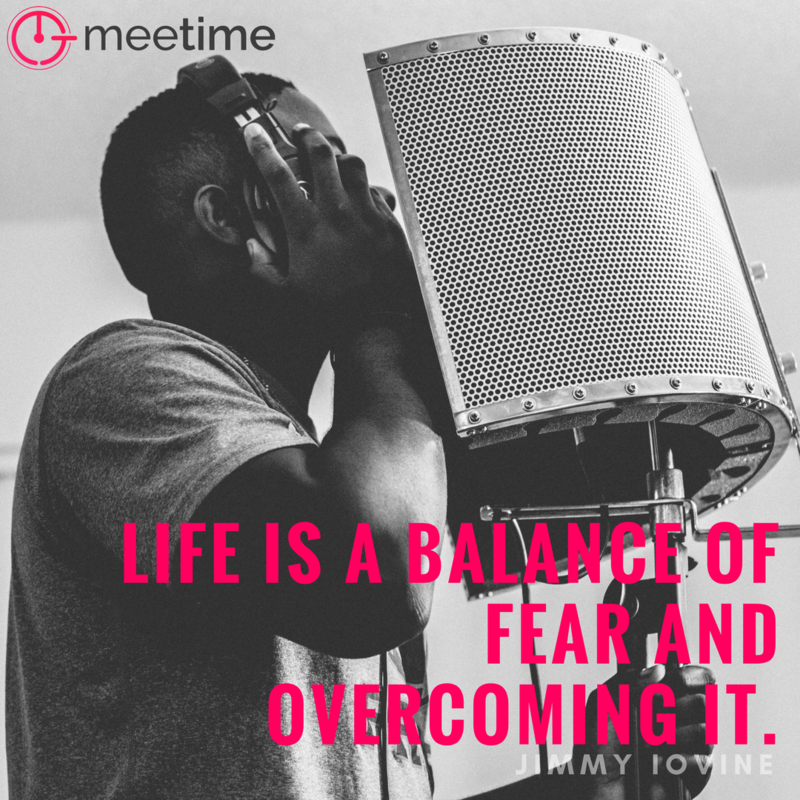 Get out of meeting hell with MeeTime.